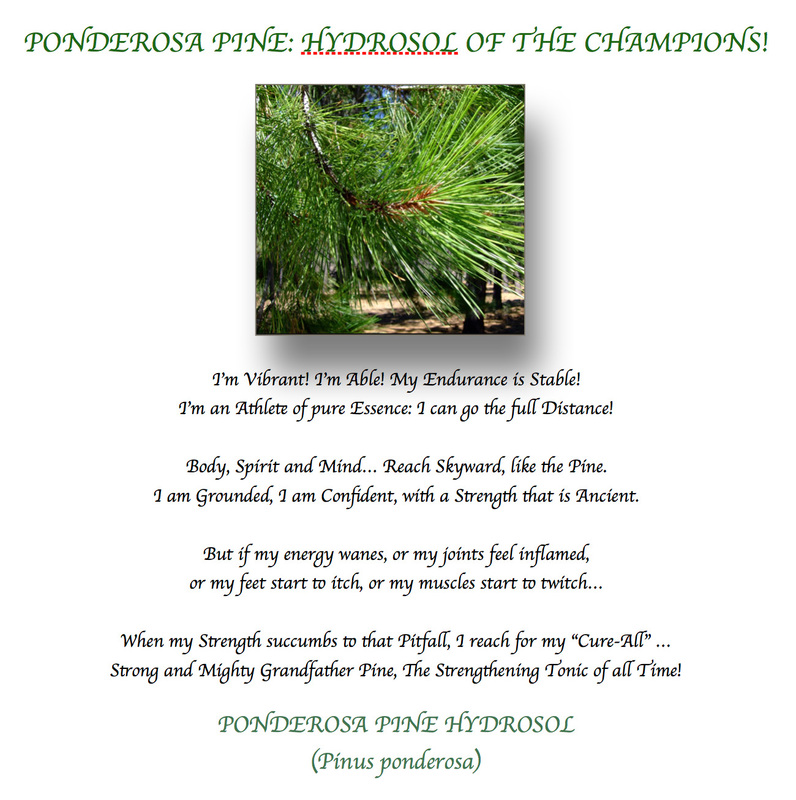 You are here... :Home/Hydrosols/Ponderosa Pine: Hydrosols of the Champions! An incredible tonic! The forest-woodsy aroma is piney and sweet. Use Ponderosa Pine for physical and mental endurance: When you “hit the wall,” spray this hydrosol on your face and mouth! It is energizing and restorative! It’s grounding, uplifting energy settles the nerves. Athletes find that misting their bodies and faces helps during strenuous work outs. Computer users feel transported from a mentally-exhausting environment into an invigorating Pine Forest! This is an effective immune system stimulant and helps to support the lungs. It has been proven useful as an anti-inflammatory for muscle, joint and tissue pain. An antiseptic and anti-fungal, it is perfect for in-between showers, washing shower stalls, cleaning under and between the toe and finger nails, or misting bed linens. It is effective in cleaning and purifying the environment. Ponderosa Pine mist helps to clear the air of unwanted microbes. Ponderosa Pine Hydrosol is a great facial toner and deodorant. It is very helpful for “fixing” (neutralizing) the skin. Ponderosa Pine Hydrosol truly will connect us to the Tree Kingdom if we just ask and spray!